My curated collection of visuals! Browse sample main lesson book pages, watercolor paintings, chalkboard drawings, etc. for Farming & Gardening. Find the Master Gardener's program at a land grant university near you. They are highly education and, also, required to do a certain number of volunteer hours in the community. I'm sure you'll be able to find someone who can be a special guest for your homeschool. Free Coffee Grounds from Starbucks for Your Compost Pile: "Grounds for Gardens"
use toilet paper rolls to make the perfect plantable little seed starting pots! we used flour/water paste and unbleached paper towel squares to make the bottoms for ours but this cut and fold method makes so much sense! This is for planting morning glory and moonflowers, or other vines. It works best making long pieces of finger knitting to weave in and out to create a strong trellis. And listen to Douglas Adams talk about it: "Parrots, the Universe, and Everything"
The talk was given at the University of California, Santa Barbara, before he died. *NEW* Praying Mantis Egg Case for hatching... so fun! I highly recommend using your public library extensively for this block, although if you can find a used copy of Roy Wilkinson's out of print book Teaching Practical Activities: Farming, Gardening, Housebuilding for Ages 9 and 10, I suggest using it to frame these two classic 3rd grade main lesson blocks. 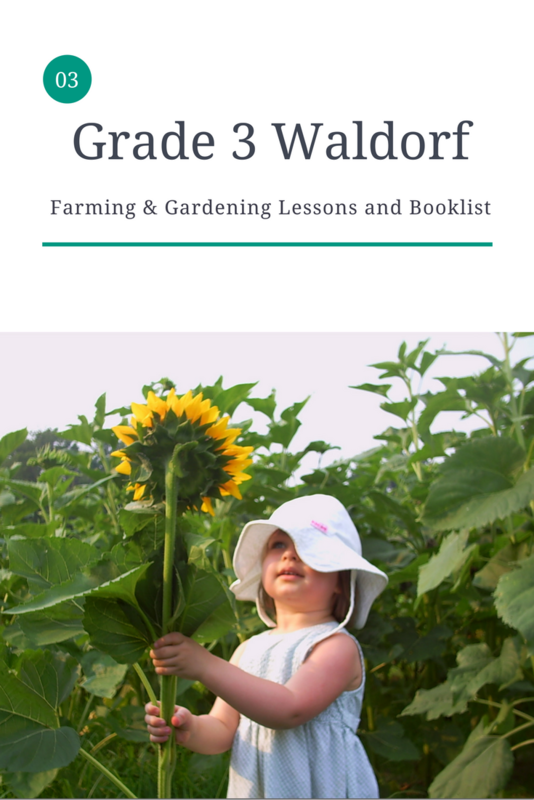 Another great option is Gardening with Kids by Sharon MacLatchie, which is a comprehensive gardening book from the 1970s by Rodale Press, available used starting at just a penny. We've tried hydroponics, container gardening, cold frames, straw bale gardening, and traditional vegetable beds. Here are some practical how-to gardening books I have and LOVE. I hope you find them helpful! Some of my blog posts from teaching this topic are below. You can also go to my blog and search for all posts with the label "Farming & Gardening." See also the notes from my 2008 Summer Camps - camp topics included Farming & Gardening and Housebuilding.